This mural honoring inspirational Seattlites was a collaboration between Antioch University students and New Horizons community members. The mural depicts individuals whose contribution to arts and social justice left a lasting impact on the city. The wall is located in the drop-in center, where homeless and at-risk youth receive access to a variety of services. 1. Jimi Hendrix, 1942-1970: A genre-defying musician considered one of the greatest guitarist of all time. Born in Seattle’s Central District. 2. 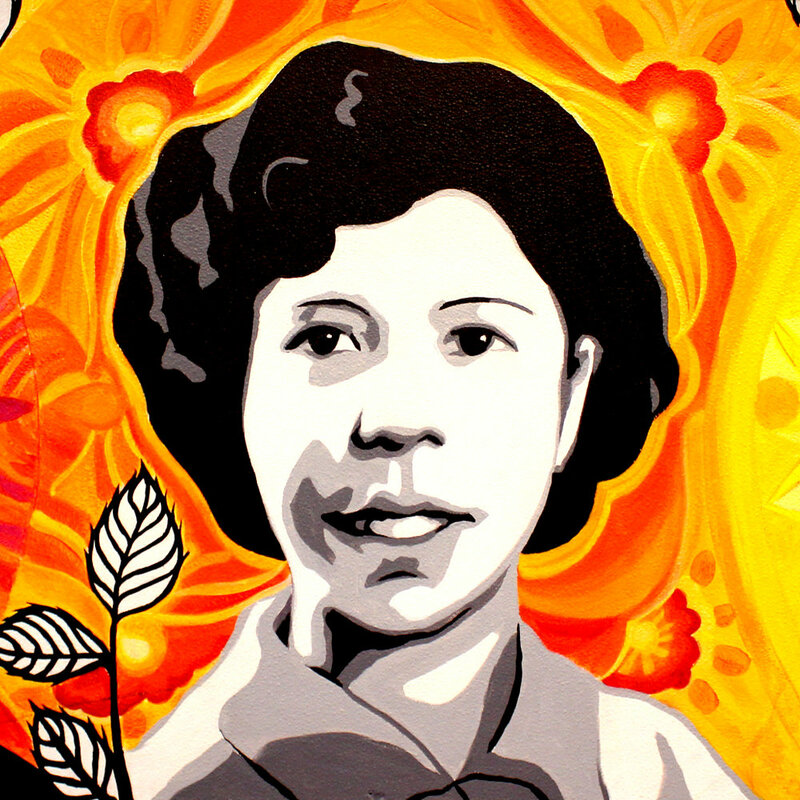 Vi Hilbert, 1918-2008: A Native American elder and conservationist of the Lutshootseed culture. Her work to transcribe the Lutshootseed language into grammar books and dictionaries was awarded a National Heritage Fellowship in 1994. 3. Bruce Lee, 1940-1973: Actor, director, martial artist and philosopher, credited with improving representations of Asian Americans in mainstream media. He was a Seattle resident and graduate of the University of Washington. 4. 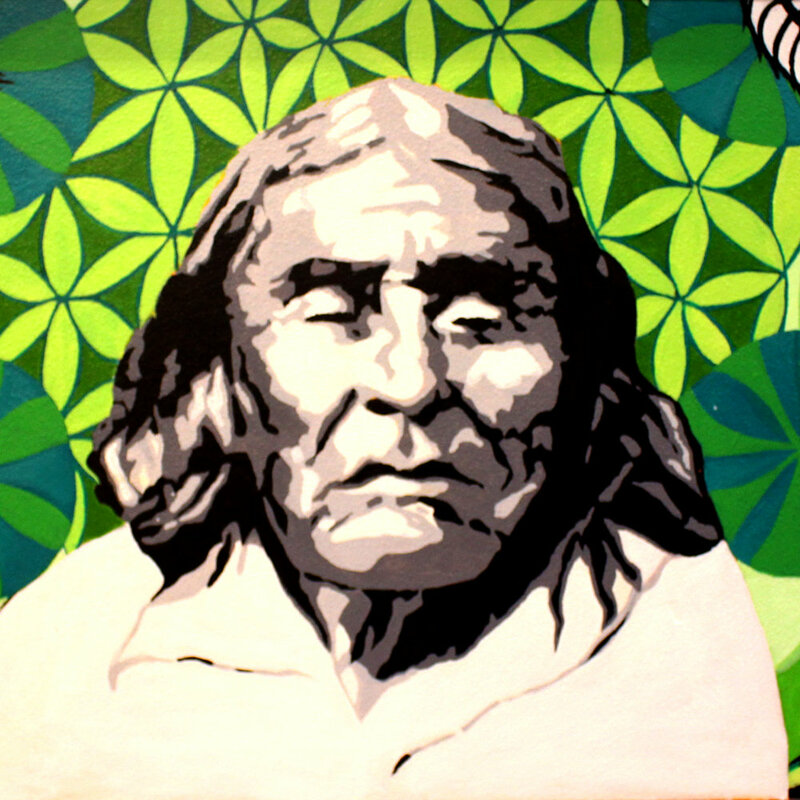 Chief Sealth, c1786-1866: Chief of the Suquamish and Duwamish tribes. He is known for his strong and peaceful leadership during European settlement of the Seattle area. 5. Bob Santos, 1934-2016: A minority rights activist and member of the “Gang of Four,” a coalition of civil rights leaders active during the 1960s and 70s. He is known for preserving the cultural identity of the International District and creating affordable housing for all. 6. Bertha Knight Landis 1868-1943: A women’s right activist and mayor of Seattle from 1926-1928. She was the first female mayor of a major American city. During her leadership she combatted police corruption and worked to improve the city’s transportation. Huge thanks to New Horizons Ministry and Antioch University students Max Burke, Yana Dareva-Morison, Kim Hardman, Brie Kuhn, Mel Plant, Miranda Wolf, Denise Young and Kendra Young-Arrowood for making this project possible.